Vacuum Regularly: Accumulated dirt can cause an antique rug to wear much faster than normal. As dirt builds up, it filters down into the fibers of the rug. The deeper the dirt gathers, the more quickly it will wear the rug. Vacuuming should be done on a weekly basis, removing dirt from both sides of the rug. Regular vacuuming will also protect your rug from hungry moths and beetle larvae. In order to avoid damaging your rug, avoid the use of power brushes that can strip the surface of your rug. Remove Wrinkles: Wrinkles may appear after shipping or folding and should be resolved immediately. Prolonged wrinkling can cause extra wear on the ridges of your rug. To resolve them, begin by rolling the carpet as tightly as possible. Unroll it slowly, repeating the process until you’ve smoothed it out. For particularly relentless wrinkles, use a steam iron with a wool setting to lightly press the wrinkle away. Stop Spills from Setting: After a spill, maintenance should be applied immediately. The longer the spill sets, the more likely there will be permanent staining. Blotting should always be your first step. Paper towels are effective for removing much of the liquid. 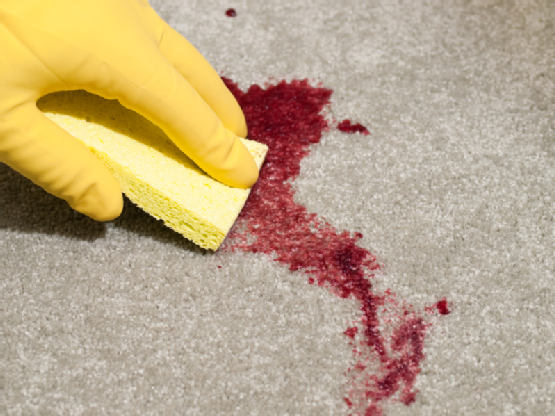 If the spill is water-soluble and the rug is water safe, then continue to add water to the spot to dilute the stain. For urine stains, dilute with water and white vinegar. After diluting, blot the stain to remove. If the stain can’t be removed after a few cycles of this pattern, then your rug may need the help of a professional. 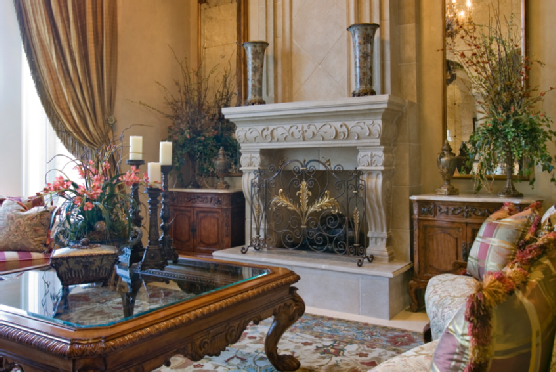 Oriental area rugs add a charm to your home that is truly unique. Learn more ways to make your antique rug last by contacting Hadeed Oriental Rug Cleaning at (703) 241-1111. Our wall-to-wall carpet cleaning service has helped thousands of DC residents repair and restore their homes. Do You Know Everything That Hadeed Can Offer You? Here Is A List of All of Our Great Services! The best Oriental rug cleaners are knowledgeable enough to restore a wide range of weaves and styles. Visit the carpet and rug experts at Hadeed Oriental Rug Cleaning to learn more tips for keeping your rug in great shape. Log on to our website or call us at (703) 241-1111 for more information. Oriental rugs are fantastic pieces of art that use weave deigns derived from several cultural influences. Learning more about Oriental weave design allows collectors to appreciate the evolution of the craft. For more information, call Hadeed Oriental Rug Cleaning at (703) 241-1111. This website explores the cultural influences in Oriental rug design. 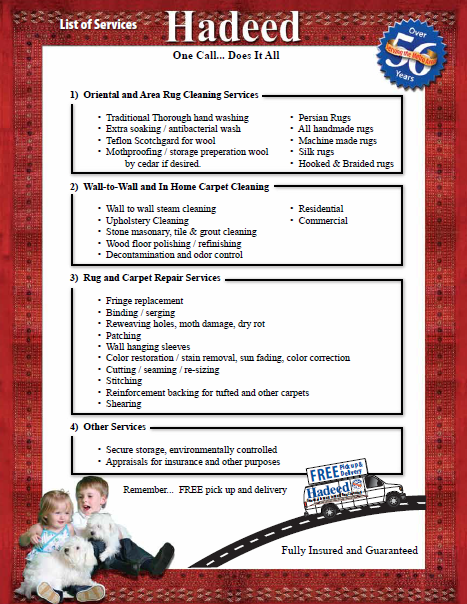 This page simplifies Oriental rug care with this straightforward cleaning tutorial. Those with an interest in Persian rugs and carpets should read the informative articles on this page. Want More Information on Oriental Rug Cleaning? This Is the Place to Be! The Weaving Art Museum’s website features photos of its exhibition Kashmir and split tapestry rug exhibits. Learn more about finding the right rug care specialist with these resources from the Institute of Inspection, Cleaning and Restoration Certification. Pick up some informative tips on picking the right Oriental rug on this website. This article provides a helpful series of tutorials on basic rug care and maintenance. This page reports on the use of computers to design and produce Persian rugs. Rug Cleaning and Repair Service: Oriental Rug Specialist Washington, D.C. True antique Oriental rugs require a restoration technician with specialized knowledge and a keen eye for detail. This documentary follows the experiences of the Hadeed family and their 50 years of experience working with Oriental rugs. This video follows a typical carpet cleaning by Hadeed Oriental Rug Cleaning in Washington, D.C. Special shampoos and meticulous hand washing combine to make the recipe for deep cleaning success. The video also displays Hadeed’s all natural drying process. 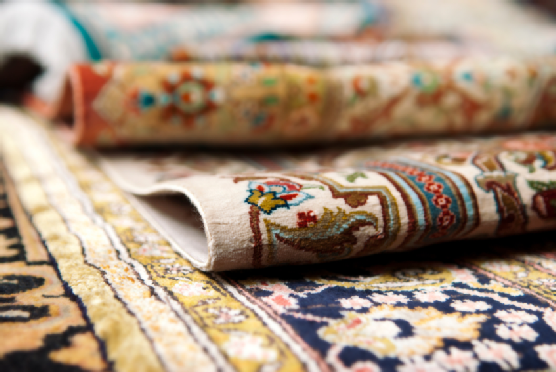 Washington, D.C. residents have access to great Oriental rug care resources. Hadeed Oriental Rug Cleaning offers comprehensive rug cleaning services for Turkish, Persian, and other Oriental-style area rugs. To learn more about our cleaning and restoration process, visit us online or call (703) 241-1111. The industry of fine hand-woven rugs is one of the oldest in the world. This video explores more about how these ancient treasures are constructed. This documentary follows the story of tapestry expert Hans Boujaran. He describes designing rugs in his homeland of Iran and his eventual travels to New York. Next, Boujaran explains the ancient process he uses in weaving and producing beautiful Persian rugs. Persian and other rugs from the Kurdistan and Azerbjaizan regions are works of art requiring careful cleaning and restoration. With over 50 years of experience, Hadeed Oriental Rug Cleaning can safely clean and repair the most delicate Oriental rugs. For contact information, visit us on the Web or call (703) 241-1111.